Now just $19.95 postfree for US customers! 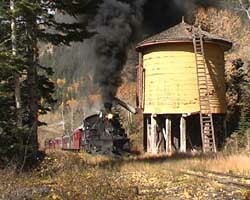 This SVS Film production is now available on DVD-R in both US (NTSC) and UK (PAL) formats. PLEASE NOTE: Whilst we are a UK-based company, we have many satisfied customers in the US and we produce DVD's and VHS tapes which are fully compatible with the TV/DVD system in the United States. 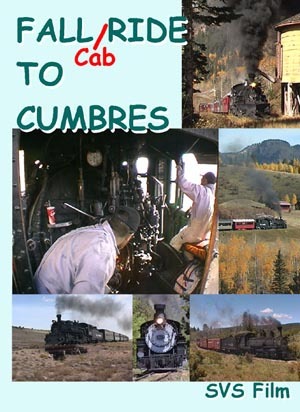 This DVD features almost one hour of the 4% (1 in 25) climb from Chama towards Cumbres on the Cumbres & Toltec Scenic Railroad along the New Mexico/Colorado border. 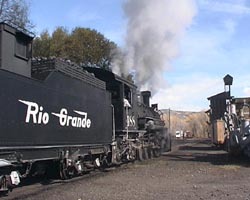 A fixed camera in the cab of ex-Rio Grande narrow gauge 2-8-2 K-36 locomotive #488 enables us to follow the skill of the engineer and fireman on this demanding route, with a selection of matching trackside views. 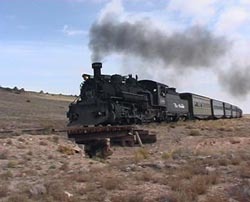 Bonus footage features scenes from some of the more remote parts of the line from Cumbres to Antonito, and scenes of the K-27 #463 and K-37 #497 in action in 1997. Finally, a selection of other SVS Film DVDs are previewed. 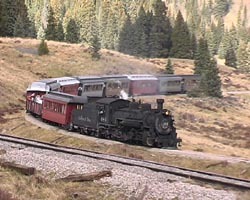 Chama to Cumbres: mostly in the cab and some trackside scenes - 1 hour 6 minutes. Cumbres to Antonito: a few of the more remote sites - 23 minutes. 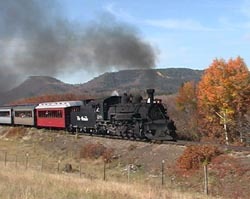 K-27 #463 in 1997 (remastered Hi8 video) - 3 minutes. 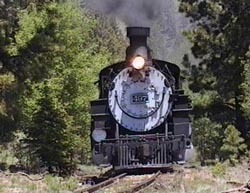 K-37 #497 in 1997 (remastered Hi8 video) - 9 minutes. Total running time approximately 1 hour 53 minutes. 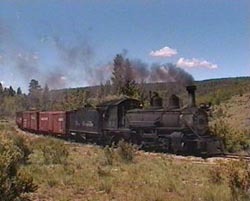 Filmed in 4:3 full screen format digital video and stereo sound, except for the 1997 clips which are digitally remastered Hi8 video. Informative maps and narration are included. "I really like this DVD ! 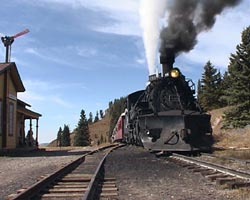 A very unique perspective on the operation of a steam locomotive, its almost like being in the cab with the engineer and fireman......Very entertaining, and will be watched over and over. I never tire of these types of video's. 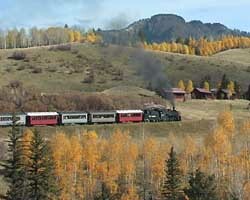 I am planning a trip this coming summer, and the Cumbres and Toltec R.R. will definately be part of it!" "Received my DVD & CD today. 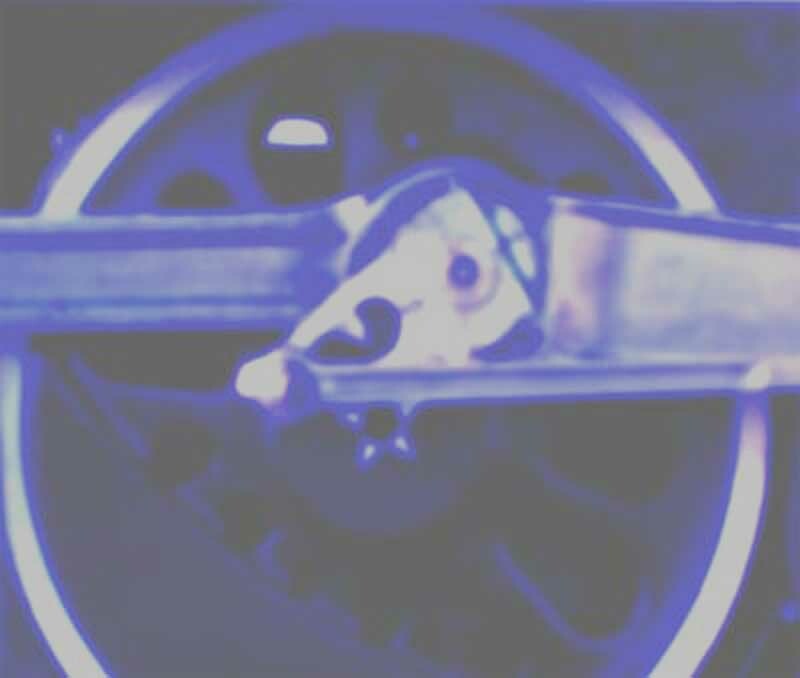 Once again you have provided fabulous video and fantastic audio. This release has the best in-cab footage I've ever seen, clear and well lit. Audio is clear, sharp and in some cases, haunting... Makes it hard to wait for your next release!" "I received the DVD in the mail and have already watched it with my parents! I have to tell you my parents absolutely loved watching the DVD, Thank you so much, it was a great way to show my parents exactly what I do, they loved it... Thank you, thank you. " DVD-R (DVD Region - all regions) - UK PAL standard - GB£15.95 second class postfree to UK. or pay by cheque drawn on a UK Bank in GB Pounds for GB£15.95 payable to SVS Film at: SVS Film, 74a Firgrove Hill, Farnham, Surrey, GU9 8LW, England. DVD-R (DVD Region - all regions) - UK PAL standard - GB£15.95 postfree worldwide.